Odille King Dasher came up with the name The Adelphean for the magazine. 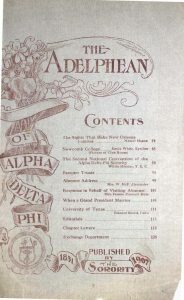 Issues of The Adelphean back to 1907 can be found and read in the digital archives. For those of you who read your issues cover-to-cover, you’ll know that we still follow that original plan — along with a few additions. 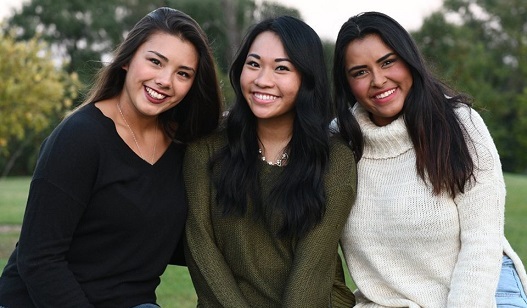 With stories about the professional achievements of our alumnae or the academic successes and future plans of our collegians, the Adelphean editors highlight our sisters who continue to forge new paths in the world. With our recently implemented volunteer and chapter organization structure, the Adelphean staff structure updated as well; we now have an editor assigned to each of the four districts. Each district editor is responsible for compiling the chapter reports and alumnae association reports as well as writing about the accomplishments of the collegians and alumnae within their districts. Our amazing technology team at Executive Office has developed an online reporting form that will make chapter and alumnae association reporting much easier. We are already seeing greater participation in reporting from chapters and look forward to bringing their activities and accomplishments to our readers. The very first editors of The Adelphean knew how important it would be to share letters from the chapters, and we still agree in 2019. These reports not only inform, they are a resource to collegians and alumnae associations and a way to connect sisters across the organization. But . . . we need you to tell us your stories! Each issue will contain at least one feature story from each district, highlighting the unique accomplishments of our sisters in the areas of business, philanthropy, science and technology, education, the arts, and more. Do you have a unique story to share? 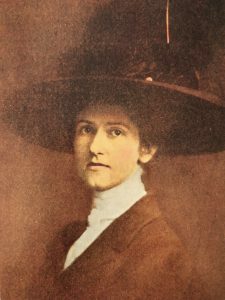 Do you know of a sister — alumna or collegian — with a unique story to share? Tell us about it! While we know we won’t be able to write a full feature for every submission, we’ll do our best to find ways to share these accomplishments. 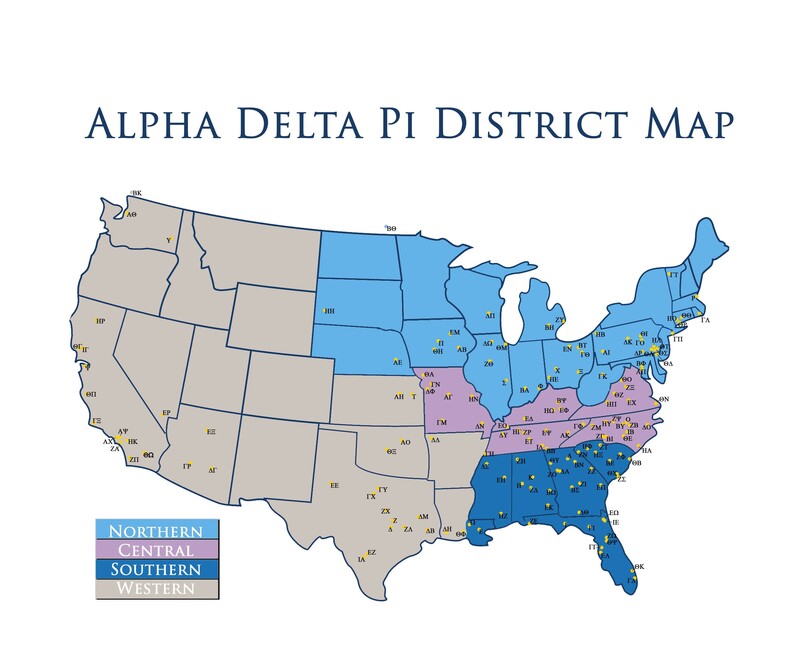 If you aren’t sure what new district your chapter falls into, refer to the map (below). What stories do you have to tell? We look forward to hearing about and sharing them soon!